New cosmic observations from the European-built Herschelinfrared space observatory have revealed previously hidden details of star formtucked away in distant galaxies. One snapshot reveals what researchers called an?impossible? star caught in the act of forming. The new images show thousands of these galaxies andbeautiful star-forming clouds draped across the Milky Way. These images were part of the presentation of the firstresults from Herschel,which was launch on May 14 of last year, today during a major scientificsymposium held at the European Space Agency (ESA), which runs the observatory,in Noordwijk, Netherlands. These results challenge old ideas of star birth, andopen new roads for future research. In a statement, European scientists said Herschel hasdiscovered an "impossible" star so massive it would dwarf our ownsun, but they are perplexed as to how it came to be. 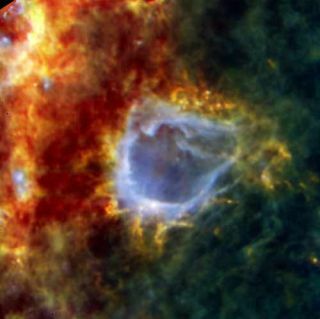 Herschel found the embryonicstar in the star-forming cloud RCW 120. The newborn star looks set to turn into one of the biggestand brightest stars in our galaxy within the next few hundred thousand years.It already contains eight to 10 times the mass of the sun and is still surroundedby an additional 2000 solar masses of gas and dust from which it can feedfurther. "This star can only grow bigger," said AnnieZavagno, of the Laboratoire d?Astrophysique de Marseille in France. Massive stars are rare and short-lived. To catch one duringformation presents a golden opportunity to solve a long-standing paradox inastronomy. "According to our current understanding, you should notbe able to form stars larger than eight solar masses," Zavagno said. This is because the fierce light emitted by such large starsshould blast away their birth clouds before any more mass can accumulate. Butsomehow theydo form. Many of these "impossible" stars are alreadyknown, some containing up to 150 solar masses, but now that Herschel has seenone near the beginning of its life, astronomers can use the data to investigatehow it is defying their theories. Herschel can see the stellar birth process because as starsbegin to form, the dust and gas surrounding them is warmed up and starts toemit light in the far-infrared wavelengths, which Herschel measures. Thediameter of Herschel's main mirror is four times larger than any other infraredspace telescope and 1.5 times larger than the Hubble Space Telescope. This size gives Herschel enough resolution and sensitivityto conduct a census of star-forming regions in our galaxy. "Before Herschel, it was not clear how the material inthe Milky Way came together in high enough densities and at sufficiently lowtemperatures to form stars," said Sergio Molinari, Istituto di Fisicadello Spazio Interplanetario in Rome, Italy. Another new space photo released today from the Herschelobservatory covers a number of the Milky Way's stellar nurseries and show howstars form in these environments. Stellar embryos first appear inside filaments of glowing dustand gas draped across the galaxy. These form chains of stellar nurseries, tensof light-years long, wrapping the galaxy in a web of star birth. Herschel has also been surveying deep space beyond our galaxy,and has measured the infrared light from thousands of other galaxies, spreadacross billions of light-years of the universe. Each galaxy appears as just apinprick but its brightness allows astronomers to determine the rate of starbirth within it ? roughly speaking, the brighter the galaxy the more stars itis forming. Herschel has also challenged conventional wisdom in thisarea by showing that galaxies have been evolving over cosmic time much fasterthan previously thought. Astronomers believed that galaxies have been formingstars at about the same rate for the last three billion years. But Herschel shows this is not true. In the past, there were many more so-called 'starburst'galaxies forming stars at 10 to 15 times the rate we see in the Milky Waytoday. But what triggered this frantic activity is not completely understood. "Herschel will now let us investigate the reasons forthis behavior," said Steve Eales of Cardiff University in Wales.